Can you imagine looking out a window and seeing this view? I would think the guys on the Apollo 12 crew would always be at the windows, with a camera in their hands, and their mouths wide open as they kept saying, “Wow…wow…wow….” This fabulous picture, which graced the cover of the 1986 The Book of the Moon, tells us a lot about the topography of our satellite. Craters – even big ones like the 93 km wide Copernicus in the middle of the frame – are remarkably flat. Its rim rises only 1100 m above the surroundings, and the floor is 3800 m below the rim crest. The ejecta deposits that are so clear on normal vertical views are seen here to be thin – 10s to 100s of meter thick – and are scoured by near parallel linear striations (look closely to the left of Copernicus). Irregular lines and clusters of secondary craters pepper the area. Reinhold, filled with its own shadow, looks rougher and higher, but that is shadow magnification; Reinhold’s rim is only 800 m high and is actually a little smoother than that of its large neighbor. The smoothness of the mare is apparent to the right, and the horizon could have been drawn with a compass, with only a few minor jiggles for the Carpathian Mountains. 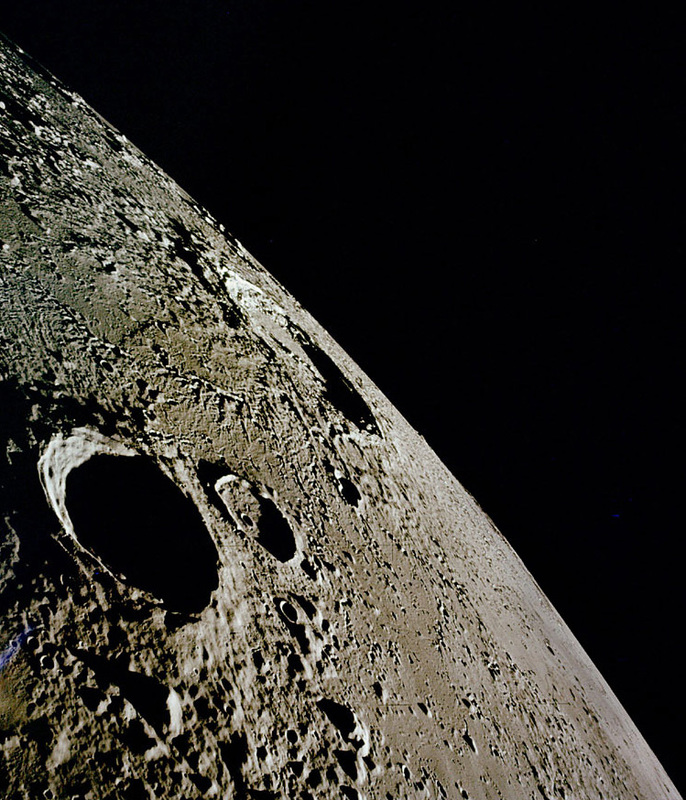 The 1986 book’s last chapter is called “Toward the Year 2007.” In it the author, Thomas Hockey, described recent renewed interest in the Moon and talked of plans for a lunar orbiter and even a Moon base. Twenty years later we have the same talk; lets hope that before another pair of decades go by people are again looking out their windows and marveling at the lunar landscapes below. The Book of the Moon at Amazon.com. IF YOU LIKE LPOD - VISIT A SPONSOR (CLICK AN AD BELOW)! For the official French version of LPOD visit ILUJ. There have been 3500 visitors to this page.